Typhoon Dodong update as of Saturday, May 9, 2015: Bagyong Dodong has slowed down as it moves towards the Eastern coast of Northern Luzon. In its latest severe weather bulletin, the Philippine Atmospheric, Geophysical and Astronomical Services Administration (PAGASA) said that as of 4 p.m. today, the center of the tropical cyclone was spotted 350 kilometers East of Infanta, Quezon. Packing maximum sustained winds of 160 kilometers per hour near the center and gusts of up to 195 kph, Typhoon Dodong is moving West Northwest at 18 kph. 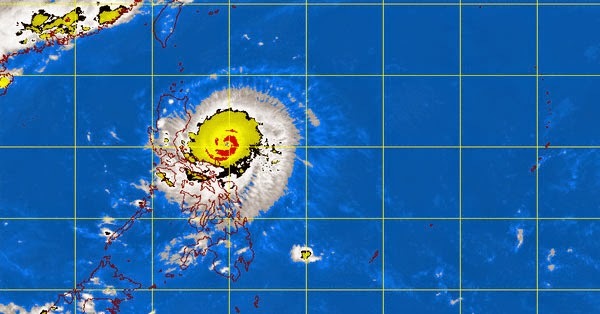 State forecasters said heavy to intense rainfall is expected within the 150-km diameter of the typhoon, which is estimated to make landfall over the coast of Isabela-Cagayan area by Sunday morning (May 10). The weather agency alerted residents in low lying and mountainous areas of the provinces with storm signals against possible flashfloods and landslides. Storm surges of up to 2 meters are possible over the eastern coast of Camarines Sur, Quezon, Isabela and Cagayan, forecasters said. PAGASA advised fishermen not to venture out over the eastern seaboard of Visayas and the public to refrain from outdoor activities particularly along beaches of the eastern section of Luzon this weekend.